Just copy-paste symbols that you like into your status, comments, messages. You can't put symbols into Facebook names due to recent change in Facebook. It seems like some symbols can form "combos" (like in video games) =) and don't work if you put them one after another. So if you see some of your symbols turning into squares after you have put some new symbol into the input field - that might be a problem. To solve it just press "Ctrl" + "Z" and don't put these troublemaker symbols. Or put them in a first place. Funny thing about these symbols is that they are different in different fonts (like "Arial", "Helvetica", etc.). I noticed this when I've seen snowman and umbrella look different in Firefox and Chrome. They looked better in Firefox. Also, take a look at my Text Emoticons and Smileys collection. They don't appear on my computer but.. You may be luckier. You can also input ASCII symbols right from your keyboard by using Alt Codes. 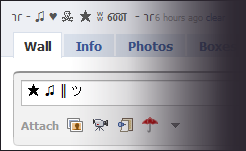 In this way you can write a part of facebook symbols that is visible on any system. People usually use those characters to draw Facebook text art. Text Art for Facebook and MyspaceMy collection of text arts (also called ASCII art). Facebook and Myspace users like this stuff. Made, mostly, by unknown artists.